Daily Mass: Celebrate Mass each weekday with one of our beloved Boston priests. Christian Witness: New. Drs Angela and David Franks talk with people who work to build a culture of love and life rooted in the New Evangelization. Guest: Tom Corcoran - Parishes equipped for mission. We've Got To Talk: New. Fr Dan continues CatholicTV's longest running studio series. This week's topic- "What Were The Chances?" One Billion Stories: New. Join Seth DeMoor as he continues sharing the stories of Catholics around the world. This week we hear stories about Family. Spotlight: New. The film fathers look at JFK movies (featuring Parkland) this week on Spotlight, CatholicTV's movie review show. Tuesday 11/12- In lieu of This is the Day, we will provide coverage of the 2013 USCCB General Assembly. Watch: Tuesday at 10:15am ET, Wednesday at 10:30am ET. Friday 11/15- Eva Stockhammer, promoting the 50th anniversary of Holyoke Catholic High School. Watch: LIVE Fri 10:30am ET, Fri 7:30pm, Sat 4:30am and 5:30pm, Mon 12am. The Gist: Encore. Rachel, Danielle, and Carolee host another great episode of The Gist. Our Guest is Leigh Anne Tuohy, of The Blind Side fame. Watch: Tue 11am and 8pm, Wed 5 am and 6pm, Thurs 12:30am. CatholicTV Kids' Saints and Heroes: This children's programming block presents special programs from the CCC of America teaching the Catholic faith through Saints, historical figures, and biblical characters. 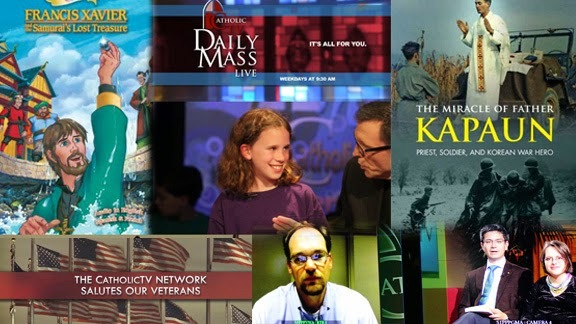 CatholicTV Presents: Presenting features from our programming partners. Watch: Mon 10:30pm, Thurs 5pm, Sat 3:30am. This week- The Clergy Fund Frontlines video. Blink U: This month on 'Blink!' We're showcasing Catholic colleges. Tune in to see great videos from Catholic colleges throughout the country, like Notre Dame, Fordham, JPII the Great and more. The USCCB General Assembly:Watch: Monday 10:15am, Tuesday 10:30am.